Music makes moods. Everyone needs to get into the spirit of the season so we decided to scare up some holiday appropriate music for you! Now, a lot of this is not our normal listening pleasure. 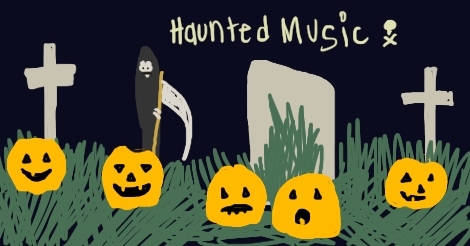 As it turns out, a lot of “Halloween Music” is goofy! Wacky songs describing absurd monster parties and little jaunty tunes about skeletons or whatever don’t really inspire a person with a thrill of terror suitable for the time. However, sometime in the past, it was decided that Halloween Music should be silly, and preferably some version of rockabilly. Call us crazy, but we don’t think the saxophone is a particularly ghostly instrument, but whatever. So we have added some good old-fashioned Satanic music, and music that causes one to think of death and dying. It’s good to have a mix. Organs, harpsichords, waltzes, and lamentations feature in these songs. And also we included some popular hits, and Aleister Crowley. Who doesn’t love that guy? Listen with us.